London 1941. The blackout reigns. Only the burning bombed-out buildings and raking searchlights defy the War Office order that has cast the city into darkness. The nightly rain of German bombs brings death amd destruction to the capital. By day you try not to talk about the looming threat of invasion and now you miss having a belly full of real food. All night you huddle in the Tube and sing songs to distract you from the inky darkness. Create investigators belonging to N's Auxilliaries, civilians recruited to battle the agents of the Mythos threatening the Home Front. Learn all about life during the London Blitz and the threats - both Mythos and mundane - that lurk in the blackout. Discover how London landmarks have been affected by the war. Construct effective scenarios with the London Blitz as your backdrop. Explore wartime London with three complete, prewritten scenarios. This supplement brings the horrors of the Mythos to London in the 1940s. 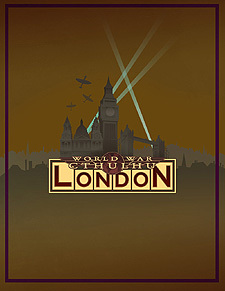 It is intended for both the World War Cthulhu: The Darkest Hour and Cthulhu Britannica: London settings.